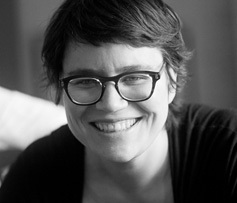 Gabrielle Tousignant created Kollontaï in 1998. Trained in Quebec City, transformed by a trip to the sources of trends and techniques from Europe and the Maghreb, Gabrielle built a line whose originality lies in the combination of materials that enhance the female silhouette. As far as I remember I have always played with fabrics and garments. As a child, I used my Grandmother's sewing machine a lot, just for fun. I later started building my own clothes and I developed a taste for that way of expressing my personality. TMR: You created a very successful collection, it's called Kollontai. Who is Alexandra Kollontai? Alexandra Kollontai was a Russian feminist of the early twentieth century. To me, she evokes a strong feminine persona in the public sphere and that's how it's related to my work: I want to design clothes that are a tribute to feminity and that can be worn in a great diversity of circumstances. TMR: What were the challenges you faced while building your brand and what is your advice to the emerging designers? Grow your brand slowly and don't get ahead of yourself. We sometimes think of fashion only as glitter and red carpets, but it actually is an industry where competition is stiff and the life span of labels is very short. Incremental change and growth is the best advice I could give. TMR: Who were your teachers in art and design? My most precious teachers are my collaborators. I surrounded myself with people that have decades of experience in the industry, they are experts at grading, designing, creating samples, etc. The fact that every aspect of creation and production takes place at my workshop on Parthenais street in Montreal allows me to be in daily contact with the people that help me create and produce garments that are all at once original and of irreproachable quality. I also like the work of Jean-Paul Gauthier and Vivienne Westwood, they represent freedom of expression in fashion. For me, fashion is an art form. It's a way of expressing who I am, how I see and feel my world and being able to express it in real life 3D. It's not just the designing that is art to me, it's also the choices I do in the materials that I use and the tools I can develop with specialised sewing machines we use in the workshop. In a way I would say that fashion is very close to sculpture. I get my inspiration from the different manifestations of culture I see in the city. A concert is inspiration, as is a visit to the Musée d'art contemporain of Montreal. I really like to be in contact with other art forms. I feel it's what's contributing the most to my process of creation, the Montreal art scene is my fuel! I don't know, I tend to see it the other way around. I want my designs to be conveyors of stamina, confidence and feminity. I offer you the line Kollontaï means I offer you a way to dress as an assertive woman whatever the circumstances. TMR: Thank you, Gabrielle, for sharing your thoughts with our readers.